The SFP4X10AO15 is a Cisco QSFP-4X10G-AOC10M compatible optical quad small form-factor pluggable (QSFP+) breakout cable that is designed, programmed and tested to work with Cisco® brand compatible servers or routers and complies with MSA industry standards. 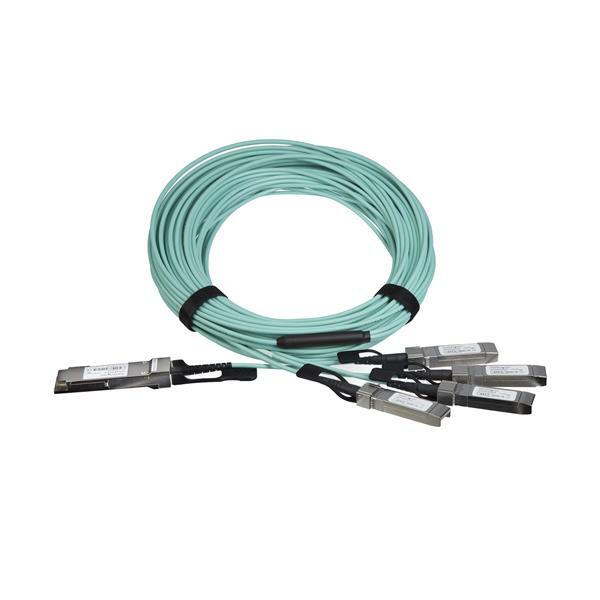 Connecting a single QSFP+ port (40 GbE) to four 10G SFP+ ports, this active optical breakout cable is fully hot-pluggable which makes upgrades and replacements seamless by minimizing network disruptions. The fiber QSFP+ cable is lighter and more flexible than QSFP+ direct-attach cables, making it ideal for installation in tight spaces and over longer distances. It is designed for high-speed interconnects and is great for point-to-point across-rack network switch or server connections, for up to four 10G SFP+ devices. All StarTech.com QSFP & QSFP+ cables are backed by a lifetime warranty and free lifetime multilingual technical support. 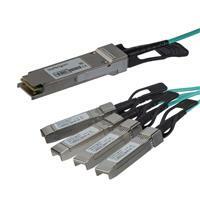 StarTech.com offers a wide variety of direct-attach SFP Cables and SFP modules, providing the convenience and reliability you need to ensure dependable network performance.